Draft Picks: Gladiators or Bricklayers? Is Red Zone Performance Real? Let my bias not be unknown, I am an Eagles fan. Watching Nick Foles fumble twice, throw an interception, and Chad Henne connect with rookie Allen Hurns twice for touchdowns -- all in the first half -- was one of the more frustrating ways to start the season. 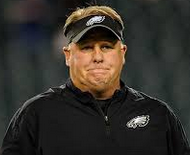 The Eagles were lucky to only be down 17-0 at halftime. On the opening drive of the second half, Philly converted twice and Nick Foles connected with Darren Sproles for eight yards on 3rd-and-9, bringing up a 4th-and-1 at the Jaguars 49-yard line. Chip Kelly is known for his progressive thinking and he didn't hesitate -- calling for a hurry-up, one of the first times the Eagles really played up-tempo in the game. The Jaguars safeties got crossed and a huge gap opened up as Darren Sproles ran untouched for a 49-yard score. The Eagles would not look back and ultimately went on to win "handily," 34-17. Had the Eagles not converted, though, Kelly would likely have been ridiculed for his call as it could have effectively ended the game (dropping Philly's win probability to 5.4%). Let's look at the fourth down call, taking into consideration the relative strength of the two teams. 4th-and-1 in the middle of the field converts around 66% of the time, way above both break-even percentages. Expected win probability going for it in this case, for a team favored by 10, but down 17-0 is 10.2% versus 8.5% punting. Props to Kelly for the quick decision that will go unnoticed for the most part due to its success. Coaches in similar situations since 2000 have punted over 50% of the time. Keith Goldner is the Chief Analyst at numberFire.com - The leading fantasy sports analytics platform - and creator of Drive-By Football. Follow him on twitter @drivebyfootball or check out numberFire on Facebook. Check out numberFire's new iOS App in the app store now. A call that may not have been possible without their being familiar with a no-huddle strategy. Welcome to the Advanced Football Analytics archive. This is where you can find over 1,500 ground-breaking articles full of the most innovative research and analysis of modern NFL football. Newer content can be found at our main site, found here. How Much Should a Win Cost? Interested in publishing your own football research, analysis, or stat-based commentary? Advanced NFL Stats Community is the site to share your thoughts and ideas. There's plenty of data available to get started. All submissions will be accepted and published. Check it out! If you enjoy Advanced Football Analytics, please consider a small donation to The Fisher House, a place where families of injured servicemen can stay while visiting their hospitalized heroes.